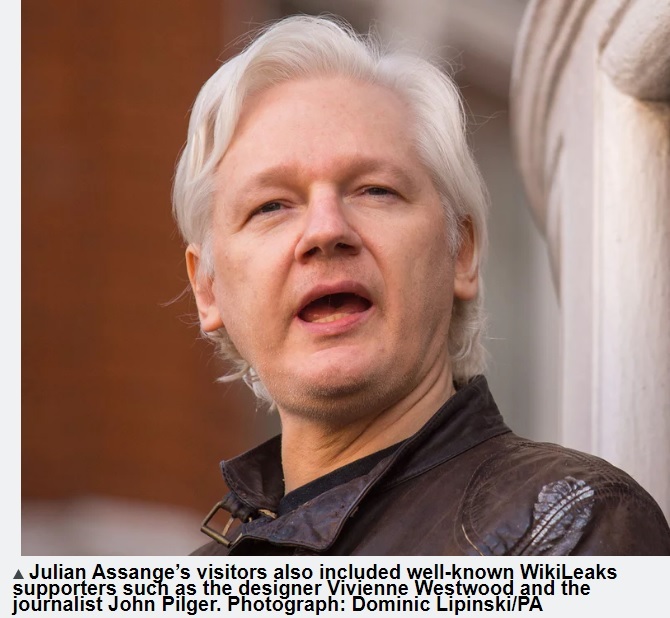 Secret logs reveal list of visitors to Julian Assange before leak of Democratic party emails. 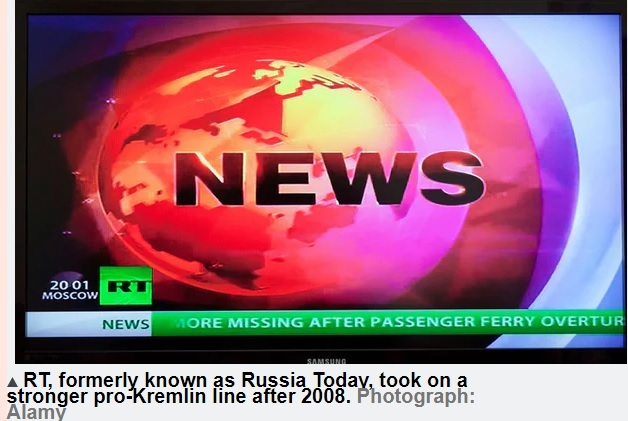 Among his guests were senior staff members from RT, the Moscow TV network described by US intelligence agencies as the Kremlin’s “principal international propaganda outlet”. The visits by RT’s London bureau chief, Nikolay Bogachikhin, who is Russian, and Afshin Rattansi, a British citizen, are likely to attract attention. WikiLeaks’ publication of the emails, which painted an unfavourable picture of Clinton, is a central focus of US federal investigators conducting a criminal inquiry into possible collusion between Donald Trump’s campaign and the Kremlin. Speculation has swirled as to how the hacked emails reached WikiLeaks and who was aware that WikiLeaks had the emails. It is unclear if WikiLeaks obtained them physically or remotely, with delivery to Assange in person only one possibility. The logs do not provide answers. Müller-Maguhn told the Washington Post that he once delivered a thumb drive with personal messages to Assange in 2016. He said he was never in possession of the hacked Democratic emails and never transported them. WikiLeaks published the first tranche of Democratic party emails on 22 July 2016. A declassified US intelligence assessment released in January 2017 found the Russian president, Vladimir Putin, had ordered an “influence campaign” to undermine Clinton’s candidacy and boost Trump. The assessment singled out RT and referred to it as a “partner” of WikiLeaks. RT told the Guardian that the broadcaster had been invited in June 2016 to participate in a WikiLeaks Brexit special, and that arrangements to participate in the show were made during the visits to the embassy. It said its journalists had no prior knowledge that Assange was in possession of the Clinton emails and never discussed the issue with Assange. The visitor logs were drawn up by an international firm brought in by Ecuador’s then president, Rafael Correa, to provide security for Assange. The secret programme was called Operation Hotel. Among the journalists, activists and artists who visited Assange in June and July 2016 were two Russian citizens, Bogachikhin and Yana Maximova, 28, a Russian émigré to the US who has worked as a volunteer journalist for a community radio station in Portland. Assange has a longstanding relationship with RT. He has regularly appeared in interviews with the Russian broadcaster and hosted a programme on RT in 2012. According to the logs, Bogachikhin visited the embassy twice in June 2016: once on 4 June, when he entered and left within a five-minute period, and again on 8 June, for a 22-minute visit. In an interview with the New York Times last year, Bogachikhin, the head of RT in the UK, dismissed claims that it was controlled by the Kremlin, and said the broadcaster was regulated as a “reputable news organisation” by Ofcom, the British media watchdog. Bogachikhin was described by a former colleague as a journalist who had quickly risen up the ranks at RT and wholeheartedly adopted the more aggressive pro-Russian editorial line that was established after 2008. His Twitter feed mirrors Moscow’s official view. Assange was also visited twice by Maximova, who was born in St Petersburg and moved to the US when she was 18. According to the visitor logs, she visited Assange for about two hours on 8 June and for half an hour on 9 June. 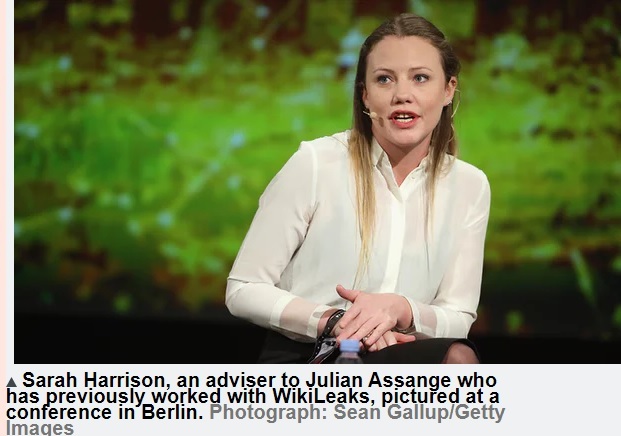 The 8 June meeting coincided with a visit by Sarah Harrison, who was a close Assange adviser at the time. When she was contacted by phone, Maximova declined to discuss the meetings, and said an attorney in Washington DC would provide a written statement to the Guardian, which she described as “protocol”. The attorney’s statement never materialised and Maximova did not respond to repeated follow-up phone calls. While many of Assange’s visitors are well known in professional circles, Maximova is not. On LinkedIn, her occupation is described as “Dreamer”. She volunteered as an independent journalist with the Portland community radio broadcaster KBOO, a left-leaning station, from February to October 2014, according to another former volunteer there. Maximova, who said she was in Germany, declined to answer questions about the circumstances of her emigration to the US. Rattansi made three visits to Assange in June, including one that ended at 4.30am. The RT journalist has been a staunch defender of Assange and of Putin’s government. One of the visits, on 23 June 2016 – the day the UK voted to leave the EU – Rattansi hosted a broadcast at the Ecuadorian embassy. Assange first declared that WikiLeaks was in possession of new Clinton material on 12 June 2016, in an interview with ITV’s Peston on Sunday. A lawsuit filed last month against WikiLeaks and the Trump campaign by the Democratic National Committee claimed Russian intelligence agents hacked into DNC servers in April 2016. WikiLeaks began publishing the material on 22 July 2016. Assange told Fox News’s Sean Hannity that the source of the material was not a state actor. Trump has denied that his presidential campaign colluded with Russians and called a criminal investigation led by Robert Mueller, the special counsel, a “witch-hunt”. Speculation about WikiLeaks’ publication of Clinton-related emails and whether anyone had advance knowledge of the leak has circulated around key Trump campaign advisers and friends of the president, including Roger Stone. Stone tweeted about WikiLeaks having further damning information about the DNC in August, before it was released in October. He has denied any involvement and said he communicated with the organisation through an intermediary. Additional reporting by Fernando Villavicencio and Cristina Solórzano.